Loved by many meatball soup fairly easy to prepare. Housewives your secrets to cooking meat for meatballs, for example, you can add a little semolina to the meat balls turned out more tender. 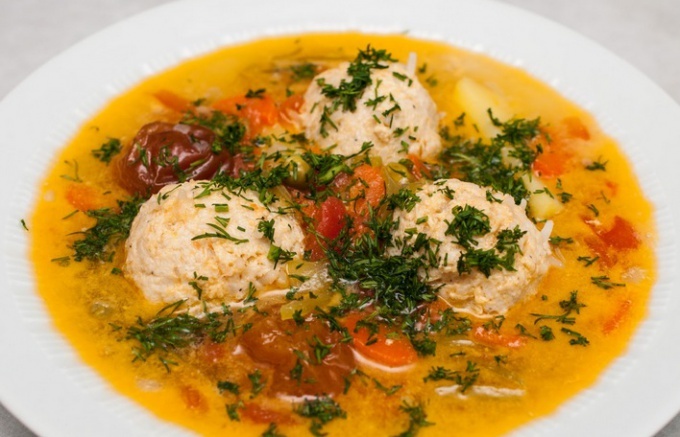 Soup with dumplings, you need vegetables – potatoes, carrots and onions. For the meatballs 400 g ground beef 2-3 tablespoons of semolina. You can add a bit of vermicelli soup. You will also need butter, parsley root, Bay leaf, ground black pepper, a couple cloves of garlic, salt. Parsley root and carrots peel, cut into small pieces or grate on a coarse grater. Stuffing put into a Cup, small onion peel and grate directly into the meat on a fine grater. Add salt, pepper, mix it all together. There also pour the semolina, stir again. Hands to form meatballs and put them on a cutting Board. - a handful of vermicelli, bring the soup to a boil and remove from heat. Now put in the soup butter and herbs, cover the pan with a lid and leave to infuse for 10-15 minutes. When the soup is cook, pour it in portioned bowls. To it is well served with fresh bread, lightly smeared with mustard.